Besides Kingdom Hearts III, what game are you looking forward to in January? The sun had freshly risen, and already was adorning the city with its rays. These rays managed to infiltrate even the heavy draperies of Alvin's office on the second floor, casting a beam of light over his shoulder and onto the desk in front of him. The brunet was not at the desk like a normal person; no, he was standing over it. A donut was in one hand and a stapler in another. Occasionally Alvin paused in his reading to take a large bit of the sprinkled donut, though the majority of his attention rested on the papers before him. He spread them out evenly, frowning deeply before spinning on heel and opening the file cabinet behind him. For several moments he frantically searched the drawer, rainbow sprinkles and flecks of chocolate icing raining down on its contents. Finally he withdrew a manila envelope from within, though growled in frustration as he threw it down on the desk. "Of course, of all days I just manage to run out of stamps," he murmured under his breath. These papers were meant to go out last Friday but, of course, Alvin being Alvin forgot. He just hoped that the boss lady wouldn't find out that he missed an important deadline, or, if she did, he'd prayed with all his might that she wouldn't be angry with him. He neatly stacked his papers before sliding them into the envelope, licking it shut and slapping a return address sticker with his name on it. Finishing the remains of his donut the brunet rose, tucking the envelope under his arm casually as he slipped out of his office. He'd just make a sweet trip to the post office, hopefully before his boss noticed that he was gone. For some reason he felt that today was supposed to be special and something new was happening, but he couldn't recall what that could be for the life of him. He shook his head, disregarding the thought just as quickly as it infiltrated his mind. Tales of Vesperia R announced! This is the official general topic for the upcoming Tales of game: Tales of Berseria! The next Tales game has been announced at the Tales of Festival. Tales of Berseria will be released for the PS3 and the PS4. No release date has been announced yet. A character model has been revealed and her name is Velvet. She will be the female main protagonist for Berseria will be voiced by Rina Satou. Credit goes to Abyssal Chronicles and here is the official website for Tales of Berseria. what I mean by the tales of games are games like this one: I have played 2 "tales of" games. One of which is Tales of Graces^. I have played and finished the game last year. It is my favorite "tales of" game by the way. Right now I'm currently playing Tales of the Abyss and I haven't finished the game yet obviously . What is your favorite dungeon in Okami? I honestly love all of them. How do I do combination artes by using the u-attack in Tales of Symphonia? I've looked this up on the internet and I can't really seem to activate it. I respect anybody on here who likes Tales of Graces f What I disliked about the game is the battle system: the battle system didn't feel feel at all. I prefer battle systems that let you do anything at anytime with no limit to it. I just love feeling so free to the point that I can do whatever move I want to do without the gameplay stopping me. Games that are like that are most of the kingdom hearts games and most of the tales games. 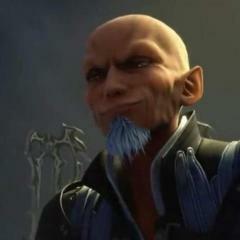 It seems like kingdom hearts 3 is probably going to be free too. Tales of Graces f was the exact opposite of that. Tales of Graces f didn't feel free at all.It limited me so much that it made the gameplay feel boring and repetitive. I hated how the numbers limited so much that I couldn't basically attack that much.The battle was also one of the most confusing battle systems I've ever seen in a video game. I tried to understand it, but I couldn't get it. Most of the music was also boring. What I liked about the game:The storyline and at least one battle theme in the game. There was only on battle that I actually liked, which was the one that played when you fought enemies when Asbel was a kid. What happened to Luke and Asch? Did they like turn into the "true" Luke or something? I'm not really sure what happened because in the very last cut scene we see a person in the distance who looks like Luke, but has longer hair. Before Luke freed Lorelei, his hair was a lot shorter because he cut his hair to show that he's putting his old self behind him and wanted to change who he was. Happy Brthday Tales of Vesperia! Tales of Versperia came out on this day in North America. It has been 7 years since the game got released back in 2008. How come tales fans ouside of Japan NEVER got Tales of innocence r? I was kinda upset when I hear that Tales of innocence r never got released outside of Japan. My question to you is why we didn't get the game at all? Hello everyone! I recently finished Tales of Xillia and Tales of Xillia 2. Now, I'm eager to play another Tales game. So the question is, should I play Graces f or Symphonia chronicles first? Any answer is appreciated!